Seattle Reign have taken the National Women’s Soccer League by storm this year, and while the regular season winners have had a relentless intensity, consistently impressive defender Lauren Barnes has been doing her bit to keep it all rather mellow. This year has shaped up very well for the 25-year-old so far. Scoring in the Grand Final as the Melbourne Victory won Australia’s W-League, she subsequently returned to parent club Seattle and has been a vital defensive player in an outstanding season up to now. In her second year in charge, Head Coach (and General Manager) Laura Harvey has taken the Reign from a 7th-place finish in 2013 to NWSL Shield winners in 2014. The team have three regular season games to play but they head into the play-offs with home field advantage secured. It is easy to pick out the stellar names in the Seattle squad but unwavering unity has been the driver behind their results this season. With collective understanding has come consistency and at the back, Lauren has been as perfect an example as anyone of that. You can find an intriguing set of personalities throughout the Reign set-up and perhaps three of the most expressive, midfielders Jess Fishlock and Megan Rapinoe, and forward Sydney Leroux, have each illustrated on here how music connects with them. As Lauren began to do the same, she revealed how her best-loved genre provides the ideal accompaniment to how she likes to live. “I personally really like reggae, it’s always been a thing of mine, I don’t know why. Most people listen to something that gets them pumped-up for a game but people make fun of me because I’m super laid-back and almost emotionless sometimes! “Reggae really relaxes me and I love it. I like The Green, and I like Bob Marley of course. For the most part this year, Lauren has had Elli Reed, Kendall Fletcher and Stephanie Cox beside her at the back. Midfielder Kim Little’s league-record tally of 14 goals has caught many an eye, while on-loan INAC Kobe Leonessa duo Nahomi Kawasumi and Beverly Goebel have combined to wonderful effect, with 11 goals and eight assists between them. Just like Lauren, Goebel comes from California, and while the 26-year-old has manoeuvred her way through numerous defensive set-ups this year, according to Lauren she has a few other moves up her sleeve. While at Upland High School, Lauren was named the Gatorade Player of the Year for the state of California. She went on to represent the UCLA (University of California, Los Angeles) Bruins and was coached during her college career by current U.S. Women’s National Team Head Coach Jill Ellis. Featuring in Women’s Professional Soccer with the Philadelphia Independence in 2011, Lauren put playing on hold in 2012 to become Assistant Women’s Soccer Coach to Nat Gonzalez at the University of California, Riverside. After finding that she missed the playing aspect, she put herself forward for the 2013 NWSL Supplemental Draft and was taken by Seattle. 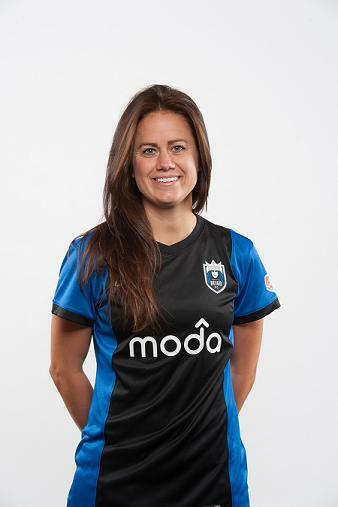 Lauren was the only player to start every game for the Reign and was recognised as the team’s Defender of the Year for 2013. Her introduction to the NWSL also presented her with the dreaded initiation scenario. For any team that has ambitions of challenging for silverware, strong leadership is essential. The Reign have had that and then some this season, with influential players to drag them through almost any kind of game. Wearing the armband has been midfielder Keelin Winters and if Lauren was to get in the studio to record a cover of a song, she would get the call to be in her ensemble! “I would pick Keelin because she wants to be a singer so bad and always dreams about being on American Idol! Elli (Reed) just because she’d be a good back-up dancer. “She really likes to dance and she’s got some moves so it’s so funny. Mariah (Nogueira), so we actually have someone who’s pretty good in the band! 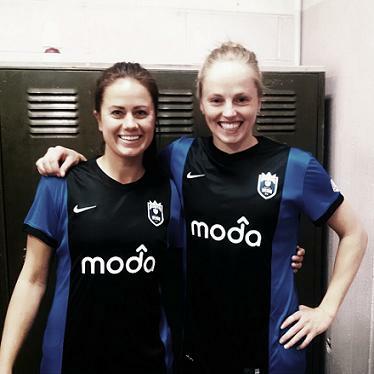 Lauren (left) with Seattle Reign defender and teammate Elli Reed. Lauren has been involved with the U.S. team at various levels since linking up as an Under-15. She won the Four Nations Tournament in England with the Under-23s in 2010 and after her form over the past year there are undoubtedly those who believe she deserves her chance with the senior team. The pre and post-game atmosphere in the U.S. Women’s National Team locker room can be very much driven by music. Reign forward Sydney Leroux is one of those to play the tracks for everyone, but what about for Seattle? “I would say on the team right now, Mariah (Nogueira),” Lauren said. “She loves music and she’s good at playing and singing. On the subject of Dani Foxhoven, the former Portland Thorns midfielder / forward was described on here by Boston Breakers midfielder Joanna Lohman back in April as a sweet girl but one who goes to metal concerts! Lauren confirms the diversity of her teammate’s live music listening choices. Dani Foxhoven’s music taste is varied, but there was a time when Lauren liked to throw in a sound that was somewhat different to the reggae she loves. Growing up in the 90s, it is probably little surprise the route she goes down when naming the first group she ever saw live! In her college days at UCLA, Lauren was a crucial part of the most frugal backline in the country during her sophomore year as the Bruins conceded an average of just 0.23 goals per game. She was a First-Team All-Pac-10 selection and a Third-Team NSCAA All-American as a senior, and her move into the pros with Philadelphia Independence in WPS seemed natural progression given her ability. After last season in the NWSL, she decided to challenge herself further as she opted to join up with Melbourne Victory in Australia. The W-League has grown considerably in stature over recent years and FIFA Ballon d’Or winner and Germany captain Nadine Angerer’s spell with Brisbane Roar last season only reinforced that belief. Lauren’s teammate Jess Fishlock, captain of Wales and scorer of four goals for Seattle this year, returned to the league for 2013/14 and joined Melbourne for the second time. In January, Lauren signed for the team as a guest player and she made a definite impact, scoring twice in her five games. With the Victory in the end-of-season play-offs, Lauren saved her goals for the biggest games, scoring the winner from the penalty spot in the 3-2 semi-final success over champions Sydney FC. In the Grand Final clash with Brisbane, she was on the mark again, this time from open play as she scored the second in the 2-0 win after Lisa De Vanna’s opening effort. Making her mark with her play and getting to take in all that her surroundings had to offer ensured that she holds her Aussie experience in high regard. Her value to the team in those five games was clear to see, so would she like to return in the future one day? “Yeah absolutely, I had a great experience over there. It was a great atmosphere to go into, (Jess) Fishlock knew me as a player and knew I’d fit the team style and the team chemistry. “The team was so perfect for me I didn’t really have to do much going into it. All the girls were super nice and super welcoming, so it was great. 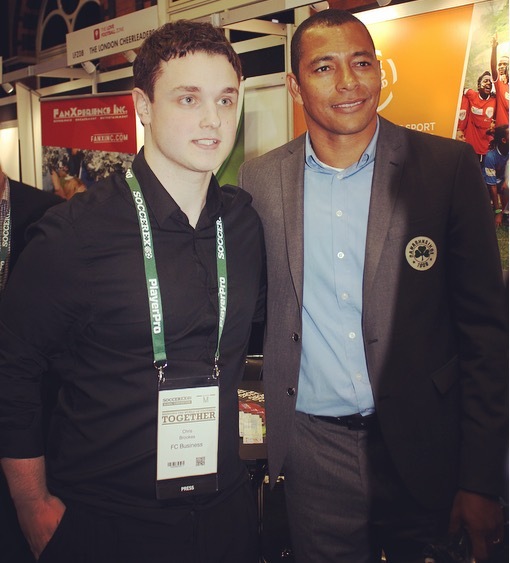 “The soccer too, they wanted to play, the same as we do here at Seattle, so I really enjoyed it. Just different styles I guess I could say I got out of it. “Off the field, the Aussies were extremely nice, I loved it. I loved all the culture; it was more of a melting pot than America so I got a lot out of it. Although 2014 has been terrific for Seattle, the inaugural year of the NWSL was a pretty steep learning curve. Head Coach Laura Harvey enjoyed much success with Arsenal Ladies but in her first season with the Reign results did not go as she had wished. Particularly testing circumstances arose, including the absence of key creative and attacking talent Megan Rapinoe, who spent a significant portion of the season with Olympique Lyonnais. U.S. keeper Hope Solo was also unavailable for a spell, sidelined for eight games with injury. Striker Amy Rodriguez, now 12-goal leading scorer for FC Kansas City, was allocated to the Reign but missed the campaign as she was pregnant with her first child. The season yielded only five wins from 22 games but a key foundation was there for this season – belief in Laura Harvey and what she was trying to implement. The Reign players speak of the former Birmingham City boss with the utmost respect and Lauren credits her approach as she sums up why it has been so enjoyable to be part of the current group. “It’s just really something special, it’s so different. We are like one huge family, from staff members to the team, it’s unreal how easy-going it is and how close we all are actually. “I think that’s what makes it. Laura (Harvey) has been so good with managing players and getting to know our personalities and that’s just helped to build our team chemistry. Saturday’s 1-1 draw at FC Kansas City meant Seattle took their 50th point of the season, leaving them 12 clear of their opponents on the night in the NWSL standings. 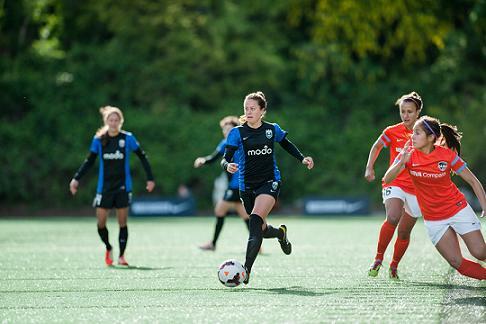 The Reign have had 15 wins, five draws and just a solitary defeat, and Lauren has played in 20 games, starting 19. Plenty of excitement awaits as the play-offs get underway on the weekend of August 23rd and Seattle will understandably be most people’s pick for the Championship. Away from all thoughts of individual games and success at the season’s end, Lauren has found plenty to cherish about the city of Seattle. “I love that it’s surrounded by water and there’s so much to do. I’m an active and outdoors person and our season’s the summer so we get most of the sun, before a lot of the rain comes! Back in WPS, Lauren scored twice in 10 games for Philadelphia but she admits it was difficult for her starting out in the professional game. Now, there is no doubt at all surrounding her importance to the Reign and Jess Fishlock was emphatic in her praise of Lauren on here in March, describing her as ‘outstanding’ and adding that ‘if she wasn’t American she’d be captain of 90 per cent of national teams’. Lauren, who majored in sociology back in college, takes on various activities when she is not training or playing, but recuperation was also in her thoughts when she discussed how she spends her time and also her long-term ambitions. “To live on a beach, relax my body! I enjoy trying to get out into the water and the ocean, whether it’s surfing or anything. When you have worked amongst numerous impressive players and struck up connections it can be tough to narrow them down to a select few. Each player interviewed on here, whether male or female, is asked to select their fantasy 5-a-side team consisting of themselves and four of the best they have ever featured on the same side as in their career. Jess Fishlock included Lauren in her line-up and the Welsh star is in turn chosen by Lauren in an all-Seattle selection. “Four is hard, there’s so many! Hope (Solo) in goal for sure – she’s the best goalkeeper I’ve ever seen. “I’d love to pick Bev (Goebel) and Naho (Kawasumi) into one (at forward) – they just have a special soccer brain. It’s way different to what we’re used to here in America so it’s just great having them come over and learning from them on the field. “They love keeping the ball and Bev does most of her moves without even the ball at her feet. People can’t touch her and it’s the most amazing thing. “(Jess) Fishlock, absolutely, in the middle – she’s a beast, I love her to death. My Elli Reed in the back – she’s my best friend and she’s a killer in the back.